Trees of Life Branches Out Works by Castillo and Sosa are on display in “Trees of Life: Cultura, Tradición e Inovación,” an exhibit at the Texas A&M University-San Antonio Centro de Artes. The exhibit also features antique pieces by Mexican folk art masters to show how trees of life have evolved over time. The two women each curated their own contributions to the show. 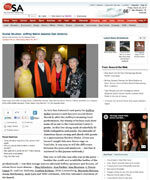 SA Express News: Rite of Spring SOLD! “Tree Of Life And Death: Rite Of Spring On My Mind” by Kathy Sosa, a piece inspired by the Joffrey Ballet’s centennial anniversary performance of The Rite Of Spring, recently sold for $9,000 with half of the proceeds of the painting benefiting ARTsTEach. KAUZ-TV: Celebrating Culture through Art During Hispanic Heritage Month, Wichita Falls Museum of Art at Midwestern State University has a special exhibit. More than 70 pieces of artist Kathy Sosa’s work take up four galleries at the museum. The exhibit consists of portraits of Latina women in traditional dress. WOAI: Her New Normal Some many people have artistic talent, and let's face it, some of us don't. So this begs the question, “Are great artists born that way or is it a learned skill?” News 4 WOAI's Michael Garofalo introduces us a San Antonio woman who picked up her first paint brush later in life, and now her new normal is rather amazing. Press Broadcast This series of paintings re- interprets the traditional folk art form, the 3-dimensional Tree of Life, into 2-dimensions, adding a contemporary edge. The paintings depict modern women integrated with Trees of Life. Influenced by 18th and 19th century Spanish and Mexican portraiture, iconic religious images and masks they are elaborate with ornamentation.Inspired by folk art, the intended effect is quirky and unpretentious. Each tree of life incorporates a set of tematic figures that represents what the woman is thinking, or obsessing about at the imagined moment. Press Print Images from the Smithsonian Latino Center's presentation of the exhibition "Huipiles: A Celebration". These paintings celebrate the intricately woven and embroidered meso-American textiles, created in the centuries-old Mayan tradition and the contemporary American women who admire collect, and wear them. Women Painting Women The Georgetown Art Center will present a one of a kind exhibit, Women Painting Women, that will feature 14 Texas female artists including Kathy Sosa. Starting as a blog in 2009, Women Painting Women has now grown into a community of female artists and has showcased more than 400 contemporary painters from across the globe. The exhibit will open to the public starting Friday, May 29th through Sunday, July 5, 2015. 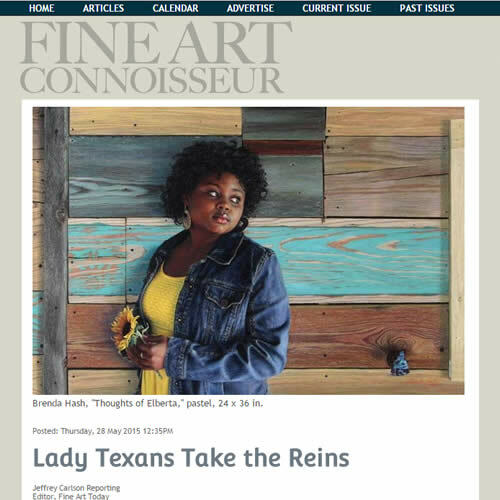 Fine Art Connoisseur Lady Texans take the reins. What began as a blog is now a global movement, empowering women artists everywhere to define how they are portrayed in fine art. This latest brick-and-mortar exhibition for the artist collective highlights the talents of Kathy Sosa and other women painters in Texas.